The virtual world of bingo has taken the world by storm for the convenience and comfort of playing in your home. With Virtual Bingo, your experience is so realistic you may have to pinch yourself to believe you’re really playing online. The many shades of lavender so vibrant, that if you close your eyes you’ll swear you smell the sweet aroma. Elegantly designed it is easy to quickly become absorbed in the Virtual Bingo world. Embracing the US market, Americans are more than welcome with no restrictions to partake in their games and mingle with other players throughout the world. Get to know your bingo roomies better with a gallery of pictures that you can put a face to those you chat with in bingo rooms. Read the glowing testimonials of satisfied players and see for yourself what everyone is bragging about under the Community tab. Bingo and slot winners are updated daily with impressive payouts. Parlay Entertainment software runs Virtual Bingo for a smooth operation, marketing strategies that offer the best promotional offers and distinguished gaming. There are three bingo rooms to play 75 ball bingo with City Bingo, Blue Sapphire Bingo and the Blue room. A complete daily bingo schedule will keep you abreast of all the games including Early Bird, Coveralls, Contests and more. 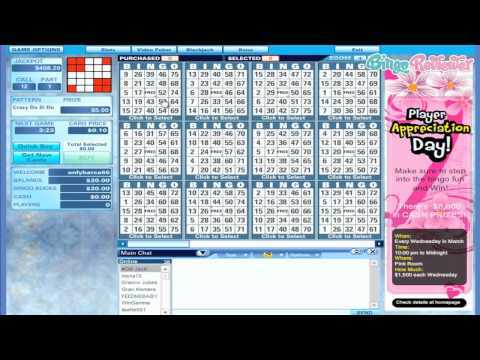 A complete list of Bingo Chat games describes how each is played and the cash prizes and bingo bucks awarded. These riveting bonus games are hosted by the Chat Moderators and are available in all the bingo rooms. 3D Slots are provided by Betsoft and set the realistic pace for high quality graphics and exception audio. Parlay Entertainment slots are also available for a full range of slot variations offering Free Spins and Bonus games. Video Poker and Keno has one of the largest varieties of games offered on a bingo site. Virtual Bingo has a spectacular display of promotions. They are so confident players will love their games they are offering a Free Bonus to try out the games. While many bingo sites offer a one-time Deposit Bonus on your first deposit, Virtual Bingo offers a massive Bonus on each and every deposit. In addition to the Free Bonus players will receive an additional bonus in Bingo Bucks. Play all your favorite bingo games and enjoy your chat sessions even more. Every night your invited to participate in the Nightly $500 Coverall that takes place at 11pm. Every night the calls will increase by one number until a winner is declared. BOGOF – Buy one bingo card and get one free isn’t just on special games or promotions. This fabulous offer is available every time you purchase a bingo card. The promotional offers are hard to beat. What’s the most impressive the enormous Deposit Bonus on every deposit including a sweet Bingo Buck Bonus. We rate Virtual Bingo with 3.25 Pink Hearts. I have a taste for Parlay bingo sites every now and then and Virtual Bingo is among my choices. The 600% deposit bonus is a huge offer but part of it is in bingo bucks and i jumped right on it but not before i took advantage of the $20 Freebie Bonus. It's a great site for Canadian players too offering CA currency. As a Parlay powered site they are big on Tournaments and i love them. The only thing worth mentioning at this site is that any Jackpot win over $1,000 will be paid in four weekly installments. Which compared to other bingo sites who do it on a monthly basis that's not too bad at all. I've been a member of Virtual Bingo for a few years but don't often play here. It's not that I don't like the site, I do! I just have so many other places to play that have my loyalty. But I would recommend Virtual bingo to all online players. It is a nice little site. With Parlay software, I always know what to expect in the bingo and slot games. New members at Virtual bingo get a $20 bonus right up front to try out all the games. There is currently a weekly parlay slot tournament with up to $2500 in prizes each month going on. You want to be sure to get in that game! Virtual bingo has several progressive jackpots going on in the City room, Blue Sapphire, and Blue room. If you are worried about fees, you won't be at Virtual Bingo as they promise to pay your fees for you when you deposit. See rules for specific details. A leaderboard on the opening page shows you right away who has won what. bingo Jackpot winners, keno jackpot winners and casino jackpot winners are listed here for all to see. Be sure to congratulate the winners when you see them in chat. Weekends offer Team Bingo so don't forget to register for the fun. There are tons of other chat games to choose from while you play bingo so don't forget to boost your balance and get all the bbs you can. With a whopping 600% Deposit Bonus, readily available live chat and customer service by email and phone, nice roomies and excellent chat managers, you can't go wrong at Virtual bingo. Come join in the fun at this USA friendly site today. They truly had me with their welcome offer here! It doesn’t really get much better than this. Not only is it a no deposit bonus, but it’s a huge one that is totally worth it. They welcome all new players with a cool $20, absolutely free. No catch! This is the kind of offer we all like to see upon joining a brand new site. With this cash, I was honestly able to play a nice amount of their games and get a solid feel for what they had to offer. Needless to say, I loved every second of it and this has quickly become one of my favorite sites! The bingo they offer here is fantastic as well. I am in love with their unique and exciting jackpots such as their progressive and jumping jackpots. Plus, they’ve got team bingo here. It’s always a nice perk to be able to get a group of friends together and play one of your favorite games as a team. It not by accidents that Parlay Ent. sites are among the very best there are, and some of the best games and promotions I have seen were on from Parlay. Quite the introduction for Virtual Bingo, an interesting site where you can play some serious bingo, and a nice thing for the Canadian players, they can use Canadian Dollars. There are four rooms: City Room, Blue, Blue Sapphire Bingo, and those are all 75 Ball rooms, a bit strange and limited offer if you ask me. On the bright side, there's a dedicated Free room, working daily from 12am to 5pm. They have quite a few promotions active, so you get a free $20 just for signing up, which you can use to play test the games, but the best part is that you can also win cash. I did well on this site and managed to cash in, and got the money in a matter of days.